A version of this article was originally published in 2014. While on a trip to do some bird watching, I saw two cooling towers off in the distance shrouded in mist. I realized that they belonged to the unfinished Satsop nuclear power station and decided to have a closer look. I took the above photo of one of the towers. Click here with your left mouse button to see a higher resolution image and then left click once again on that image to see it at an even higher resolution. Note the stairs zigzagging along the side to get a sense of scale. "These designs are popularly associated with nuclear power plants. However, this association is misleading, as the same kind of cooling towers are often used at large coal-fired power plants as well." 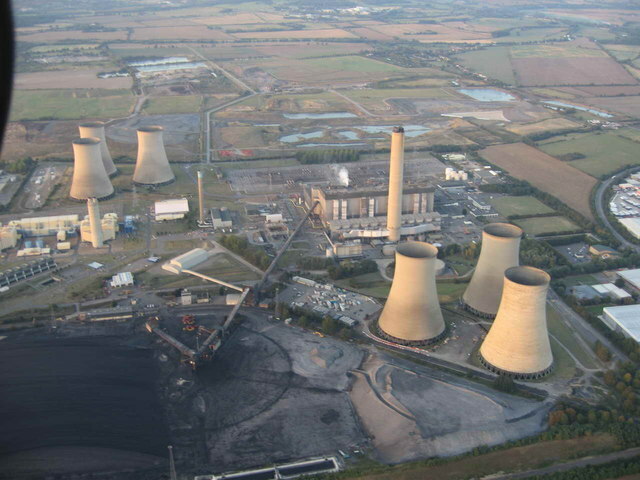 The Didcot power station pictured above burns a combination of coal, natural gas, and oil. Note the use of six hyperboloid cooling towers. Cooling towers are used to condense the steam exiting the steam turbines back into liquid water to be converted into steam again and sent back through the turbines. This greatly reduces the amount of water lost as steam. It is odd that cooling towers that are widely used at all types of power plants and that have no safety function have become iconic nuclear plant symbols. Yes, odd indeed. 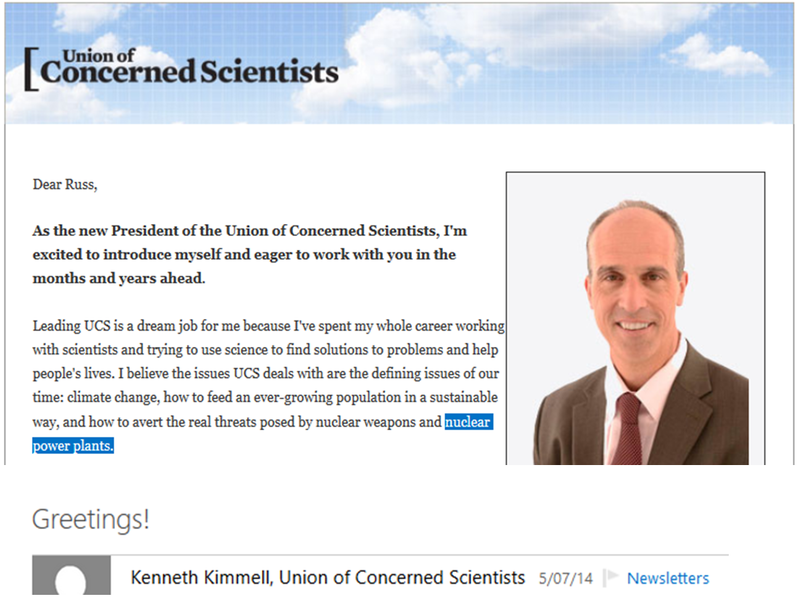 It would appear that the "experts" at the UCS writing these antinuclear articles (subsequently converting them into official looking PDFs) were unaware that cooling towers are not unique to nuclear power stations. creates a natural draft like your fireplace (ambient air is pulled in at the bottom). The steam must pass through a plastic grid that is being sprayed with water, which in turn, causes the steam to condense back into water. This strong natural updraft negates the need for fans to move the steam. One might guess that the hyperboloid shape may have something to do with the Venturi effect, but in reality, the shape is primarily for structural efficiency (load resistance at a minimum cost). Cylindrical cooling towers are not as wind or earthquake resistant for the amount of material they contain. 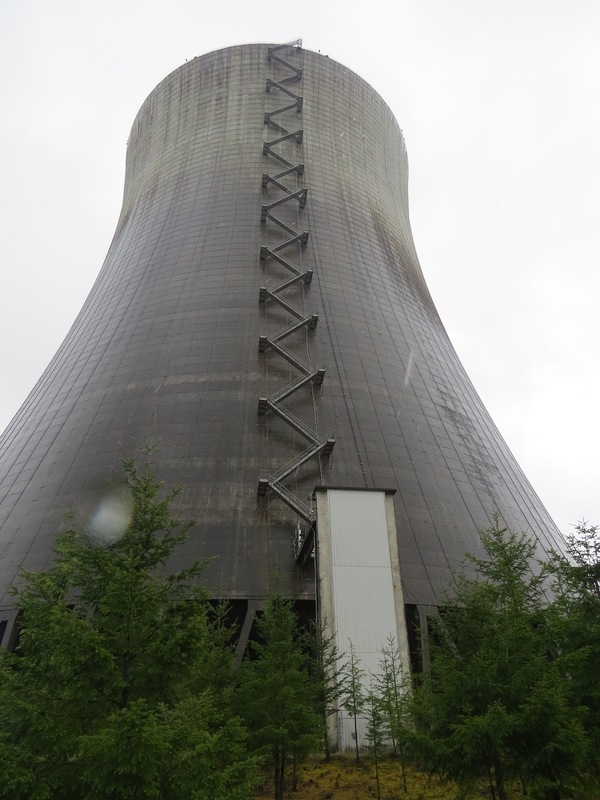 Click here to see a YouTube video of the inside of a working cooling tower that uses fans. To get a sense of scale, note the eight foot high fence around the reactor containment structure on the left. I’m always amazed by how diminutive the containment domes are–smaller than many oil, or municipal water storage tanks. These house the heart of a nuclear power plant; the reactor vessel which contains the nuclear fuel rods that boil the water to make the steam that spins the giant pinwheel (steam turbine) that is connected to the electric generator the sends electricity over the grid to our homes and cities. This is also the only part of a nuclear power plant that is different from other thermal power plants that use a different heat source (coal, biomass, natural gas, solar, geothermal). Click here to animate the above schematic. Coincidentally, that looks an awful lot like the Seattle skyline. The terms “nuclear reactor” and a “nuclear power plant” are often used interchangeably, which can be confusing because they are not the same thing. A power plant (or power station) may have more than one nuclear reactor (each inside its own containment structure) on site. The Fukushima Daiichi nuclear power plant had six reactors (of which three were destroyed by the tsunami), each inside a steel and concrete containment structure, which are in turn housed in a steel and sheet-metal outer building. Although three of the Fukushima power plant reactors were damaged beyond repair when a tsunami overwhelmed the emergency power generators, the other three reactors could, in theory, still be used by the power plant to produce electricity. The Chernobyl nuclear power plant (the poster child for how to do nuclear energy wrong) continued to produce electricity using its other reactors for well over a decade after one reactor (which had no containment dome) experienced a meltdown. 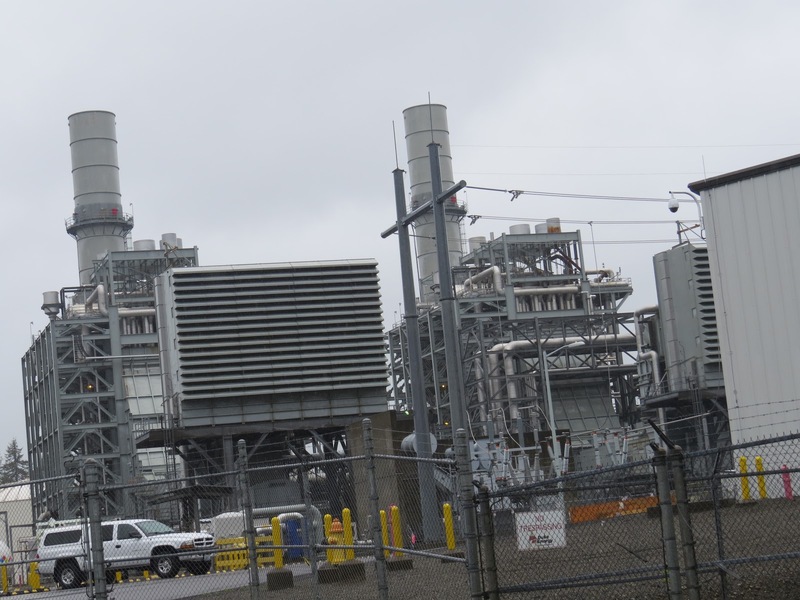 "Energy Northwest (formerly Washington Public Power Supply System) is a United States public power joint operating agency formed by State law in 1957 to produce at cost power for Northwest utilities. Headquartered in Richland, Washington, the WPPSS became commonly known as “Whoops” due to over-commitment to nuclear power in the 1970s which brought about financial collapse and the second largest municipal bond default in U.S. history. WPPSS was renamed Energy Northwest in November 1998." "The directors and the managers of the system had no experience in nuclear engineering or in projects of this scale. System managers were unable to develop a unified and comprehensive means of choosing, directing, and supervising contractors. One contractor, already shown to be incompetent, was retained for more work. In a well-publicized example, a pipe hanger was built and rebuilt 17 times." There were four proposed nuclear power plants. Click here for a photo and quick facts about each. 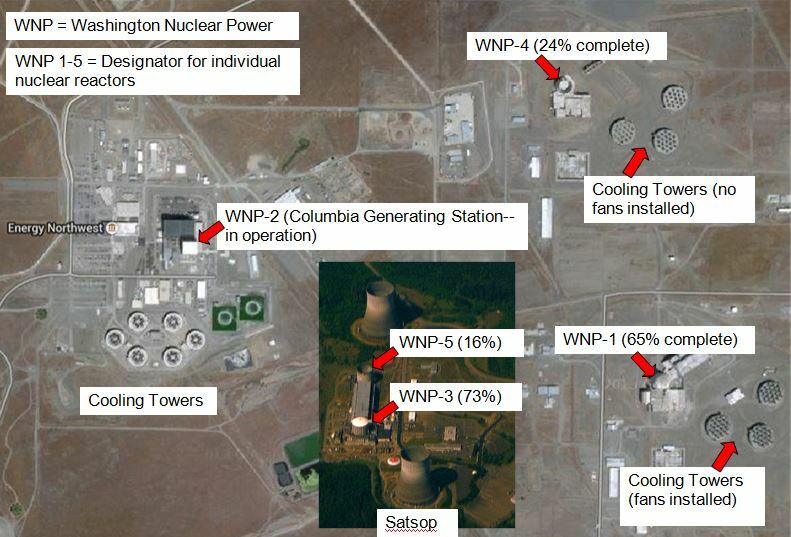 Three of them were to have a single reactor and one (in Satsop) was to have two reactors (containment domes shown above) for a total of five reactors. Out of the four planned power plant/stations, only one was completed and is now called the Columbia Generating Station. Note in the above graphic I put together (to better understand what had gone on) how radically different each power station is from the other. They have three different containment structure designs as well as three different cooling tower designs, and probably different everything else on the inside as well …unbelievable. The French and Canadians used one design which they repeated over and over again. The cost to build the first 777 airliner was astronomical. Imagine the expense of building a different airliner from the ground up for every customer.